SAP Business One starter package is a comprehensive business management solution for small companies. By combining the best small business features of SAP Business One with preconfigured best-business practices tailored to your business, SAP Business One starter package gives businesses a single application that streamlines accounting processes and integrates finance, sales, purchasing, customer relationship management, and inventory functionality. SAP Business One starter package manages all core business functions for up to 5 users, and costs less and is faster to implement than the full version. With a go live schedule of three to ten days, SAP Business One starter package is a low-cost, low-risk solution that is ideal for small businesses looking to gain a competitive advantage and accelerate profitable growth. The SAP Business One starter package helps you manage your general ledger, journals, and accounts payable and receivable. You can conduct all your banking activities – including processing payments by check, cash, credit card, bank transfer, and bill of exchange – as well as reconcile various accounts and create financial reports for profit and loss, cash flow, balance sheet, and aging. You can also update account postings at the exact time relevant business events occur. With SAP Business One starter package you can create quotes, enter orders, and provide better customer service. You can also track sales opportunities and activities from first contact to the close of sale. The software also lets you manage and maintain customer contacts with full Microsoft Outlook synchronization, which results in increased sales effectiveness and stronger customer relationships. Every small business needs a systematic approach to managing the procurement process, from creating purchase orders to paying vendors. The SAP Business One starter package helps manage the complete order-to-pay cycle, including receipts, invoices, and returns. The starter package also lets you readily manage your inventory and operations, including delivery, and billing. You can perform inventory valuation using different methods such as standard costing, moving average, and FIFO. You can monitor stock levels and track transfers in real-time and across multiple warehouses. In addition, you can run real-time inventory updates and availability checks and manage pricing and special pricing by automatically applying volume, cash, and account discounts to transactions with vendors and customers. SAP Business One starter package provides powerful integrated analytic and reporting tools to help you access the critical business information you need. With fully integrated SAP Crystal Reports® software, you can gather data from multiple sources and generate timely and accurate reports based on critical company data across financials, sales, customers, inventory, and operations. The starter package offers additional functionalities such as “drag and relate” and the ability to drilldown through multiple levels of relevant data to get complete information instantly. Integrates core operations – manage accounting, sales, purchasing, inventory, reporting, and more. Want to learn more about SAP Business One Starter Package. We can help. 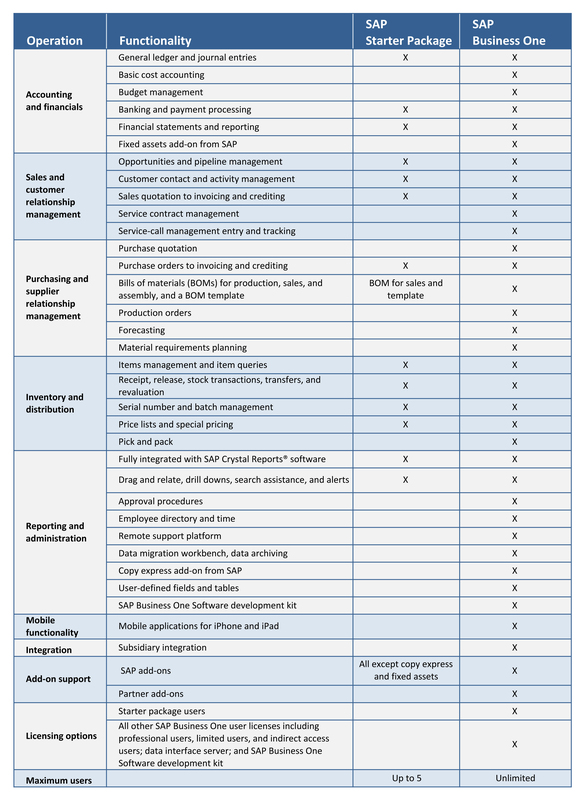 Is SAP Business One Starter Package right for you? Businesses that need more than standard accounting or nonintegrated business software are great candidates for the SAP Business One starter package. It gives businesses instant visibility, efficiency, and control over finance, sales, purchasing, customer relationship management, and inventory functionality. SAP Business One starter package empowers businesses with the ability to manage complex business scenarios, take advantage of preconfigured software settings, and experience immediate results. Starter Package’s quick implementation time and the easy-to-use administration tools allow businesses to be fully operational in a few days. Plans for growth? No problem. Companies that implement SAP Business One starter package do not need to worry about outgrowing their business application. Starter package allows companies to easily upgrade to the full version of SAP Business One as their business needs evolve. With the click of a mouse, businesses can instantly increase their software functionality and be ready to meet growing demands. That means no new software. No additional hardware. No operational disruptions. No learning curve. And no data migration. Just the same great business management application with new functionality and unlimited potential. SAP Business One starter package gives small businesses the tools to use IT as a means to create market advantage and achieve goals.